Upbound above 6 Mile Point, July 16, 2010. 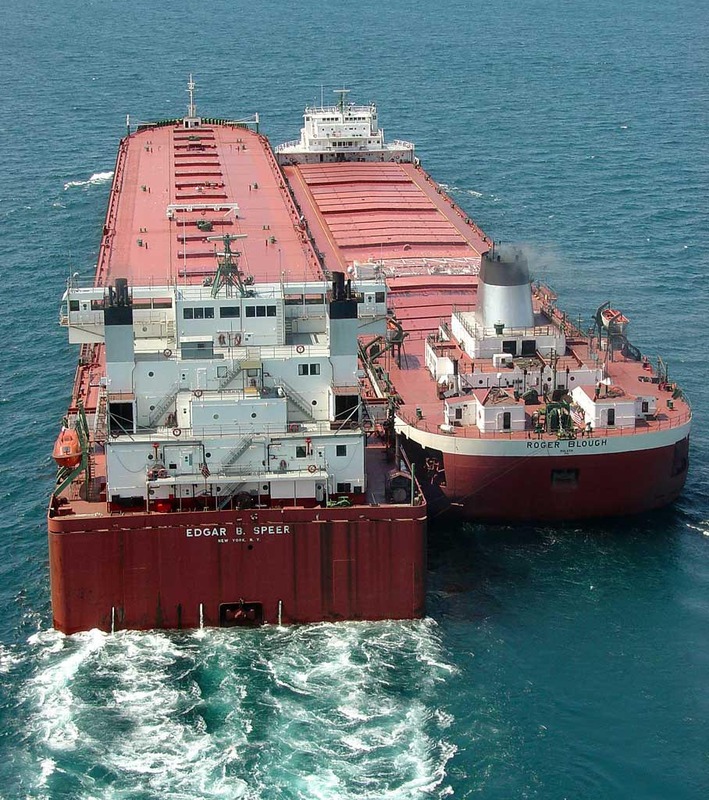 This large traditional styled Great Lakes self unloading bulk carrier was built in two sections as hull #900 by the American Shipbuilding Co., Lorain, OH for the USS Great Lakes Fleet, Duluth, MN at a cost of approximately $20 million. The keel of the 437 foot bow section was laid September 3, 1968 and was float launched December 21, 1968 (less ballast tanks due to the restricted size in width of the drydock). 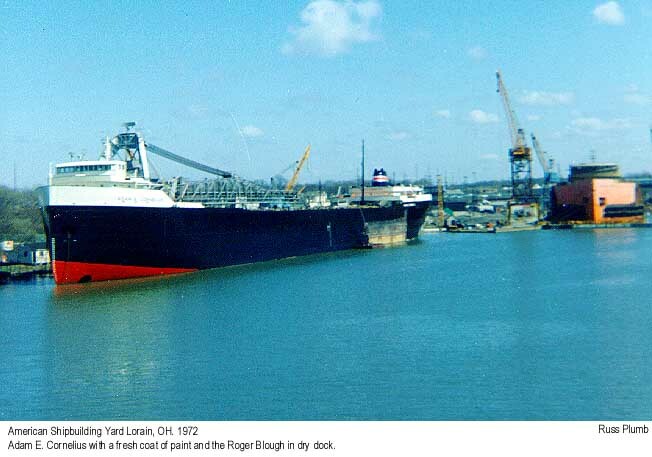 A new 125 foot wide drydock had been constructed where the keel of the 421 foot stern section was laid December 29, 1969. The bow section was floated into the new drydock July 25, 1970 and was joined to the stern section. 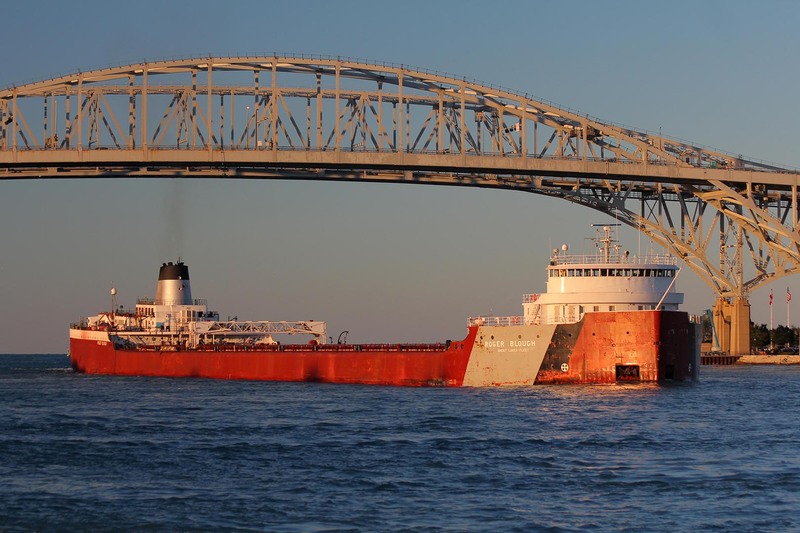 With this incident behind, hull #900 was christened June 5, 1972 as the Roger Blough in honor of the retired Chairman of the Board of the United States Steel Corporation. 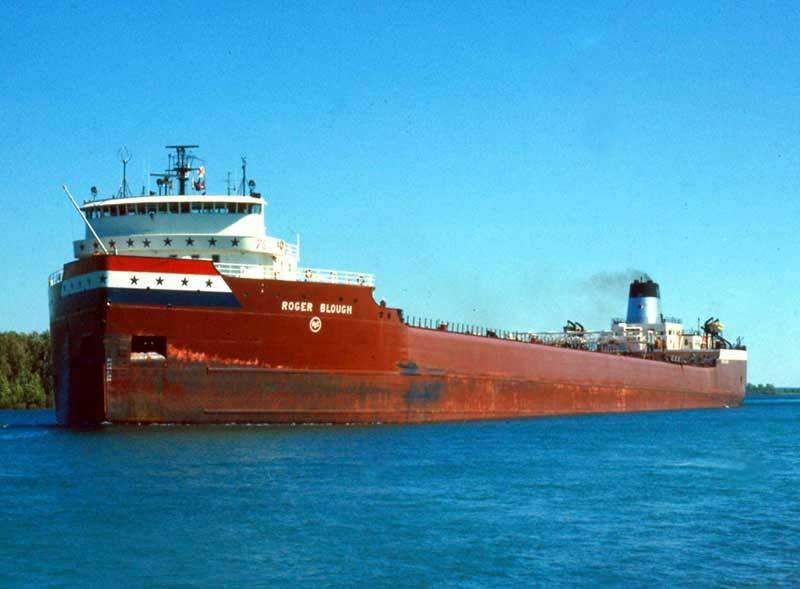 The Roger Blough sailed on her maiden voyage June 15, 1972 departing Lorain in ballast for Two Harbors, MN. 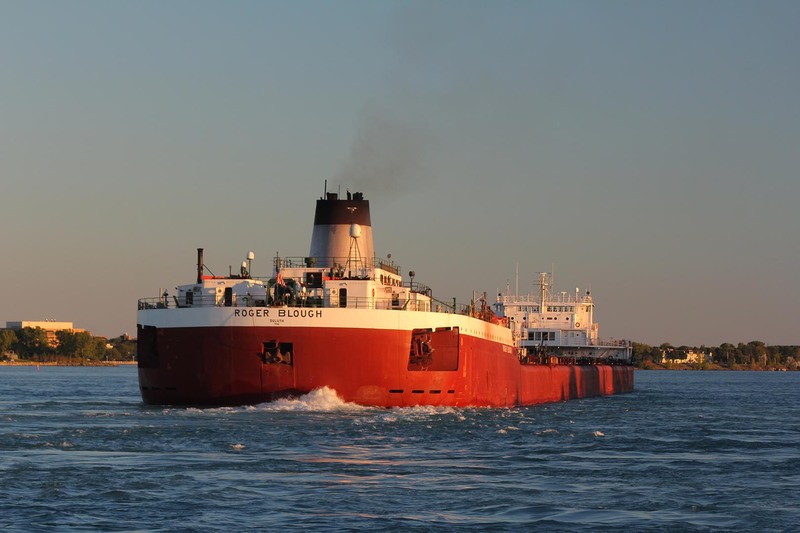 While on this voyage, the Roger Blough carefully sailed upbound passing by the sunken Sidney E. Smith, Jr. in Port Huron, MI on June 15th. 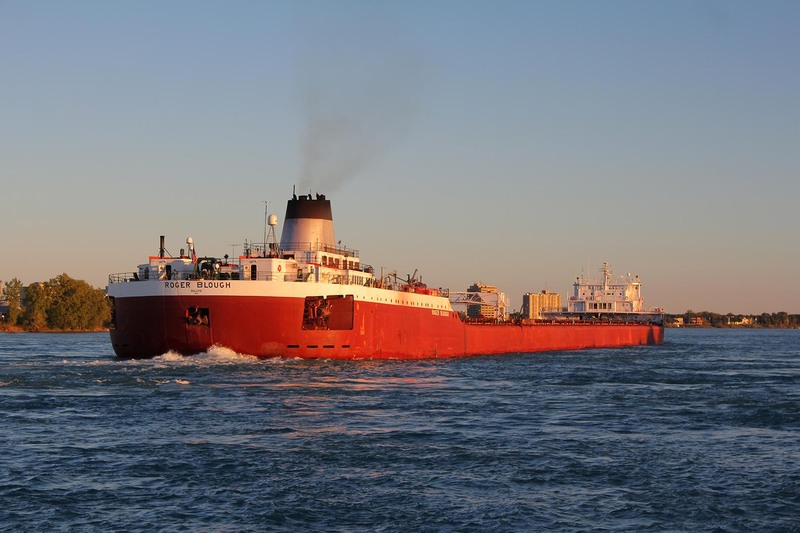 Upon arrival at Two Harbors, the vessel took on 41,608 tons of taconite ore pellets. 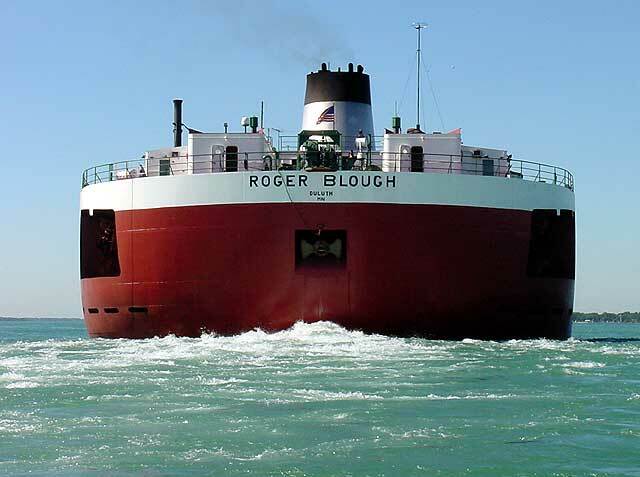 The Roger Blough is powered by two Pielstick model 16PC2V-400 four stroke, single acting V-16 cylinder 7,100 b.h.p. diesel engines (built by Fairbanks Morse & Co., Beloit, WI) burning intermediate grade 320 fuel. The power is fed through a Falk single reduction gear box to a controllable pitch propeller giving the vessel a service speed of 16.7 m.p.h. 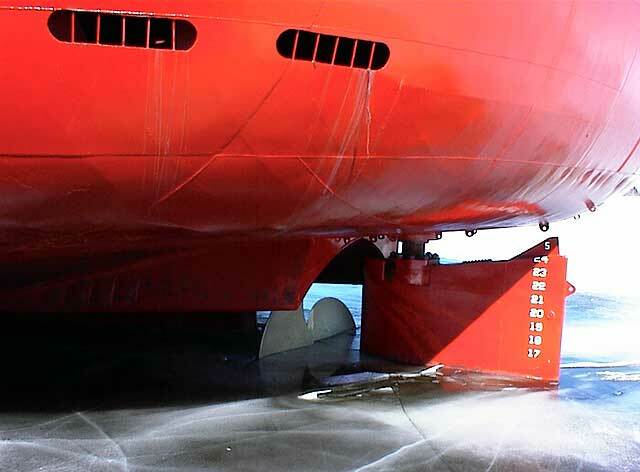 The vessel is equipped with a bow thruster. 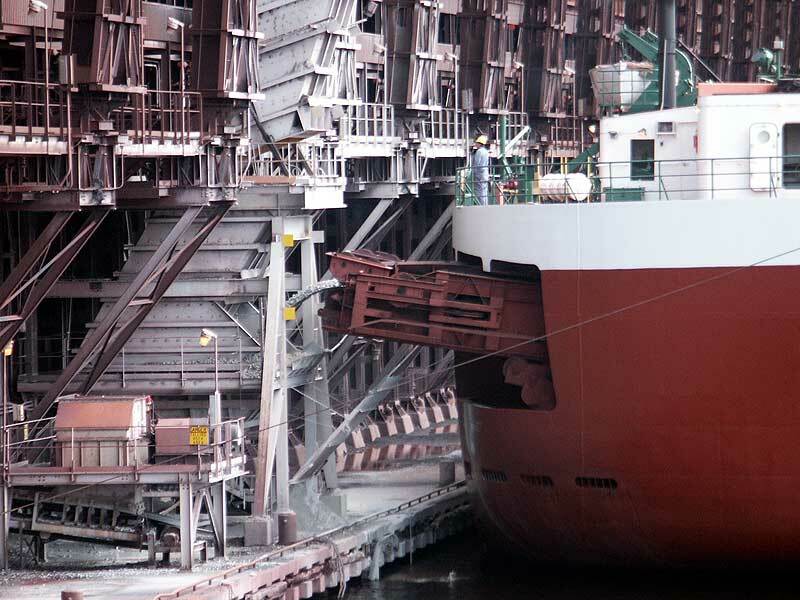 The Roger Blough’s self unloading system was designed specifically for the unloading of taconite ore pellets into compatible hopper systems on shore. The vessel was designed for the delivery of these pellets to U.S. Steel docks at Gary, IN; South Chicago, IL; and Conneaut, OH. The shuttle type transverse self unloading boom is located below the boat deck in the stern of the vessel behind the engine room. This boom can be extended 54 feet to port or starboard and unload at a rate of up to 10,000 tons per hour. 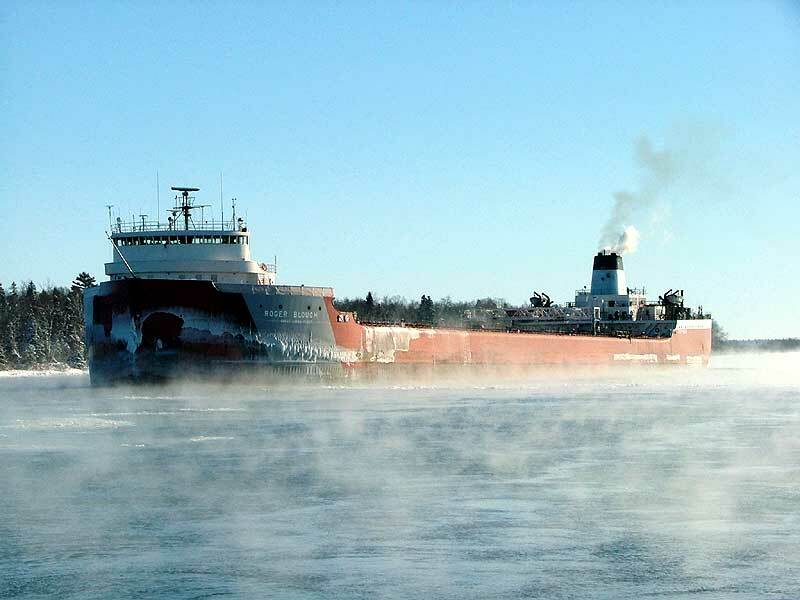 The Roger Blough is capable of carrying 43,900 tons at her mid summer draft of 27’ 11” in five holds fed through 21 hatches. All accommodations for the officers and crew are equipped with private baths and individual temperature controls for heating and cooling. 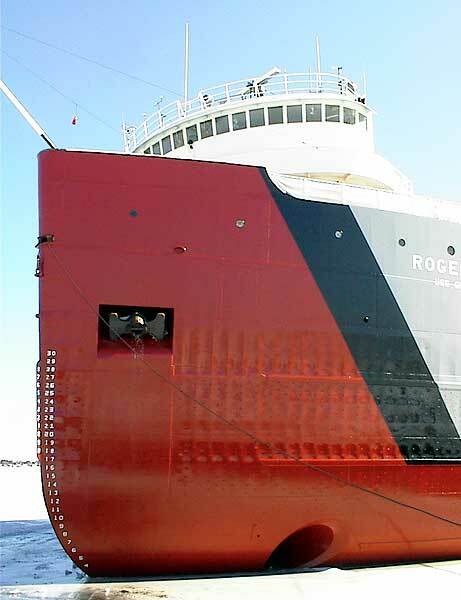 The hull of the Roger Blough was built so that it actually undulates as the vessel works in heavy seas. This hull will heave and bend thus arching her back as she negotiates the waves. This form of construction contrasts with older, smaller vessels whose rigid hulls were constructed with two arch supports stretching nearly the full length of the vessel resulting in a “springing” action while working heavy seas. 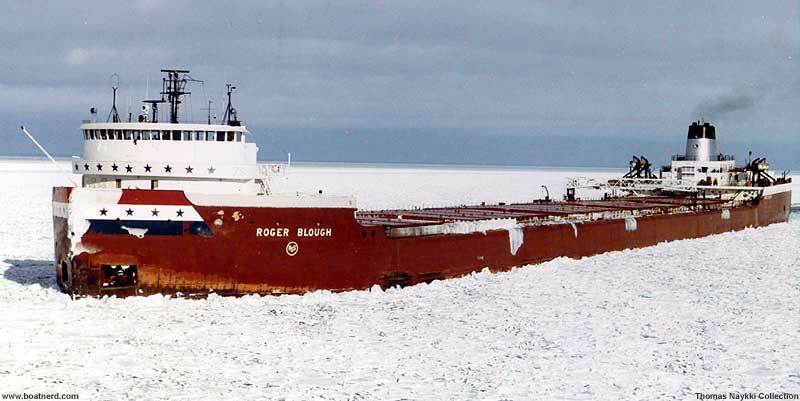 The Roger Blough is noted to have struck the stern of the Philip R. Clarke on January 11, 1973 while working in ice in the Straits of Mackinac; repairs being completed at Lorain, OH during the 1972/73 winter lay up. 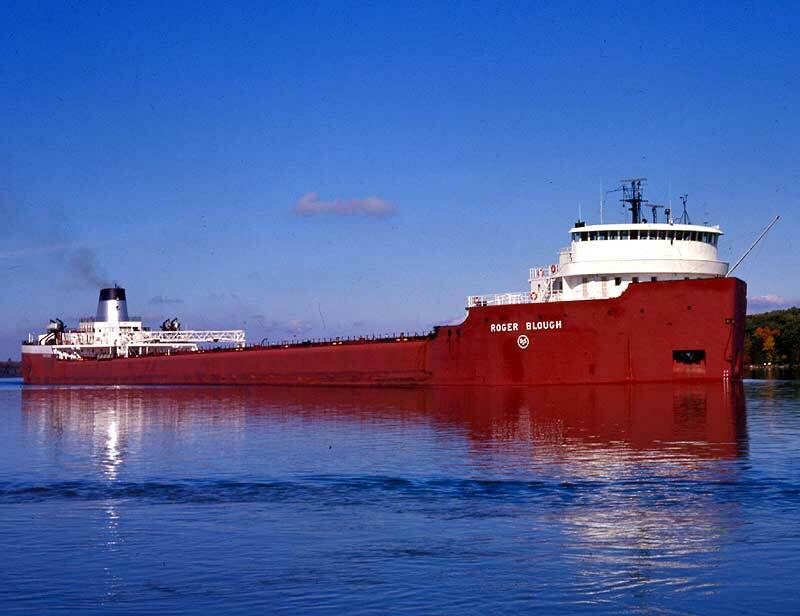 Due to the Roger Blough’s cargo specific design and economic conditions; the vessel was laid up at Sturgeon Bay, WI from September 12, 1981 through until September 25, 1987. 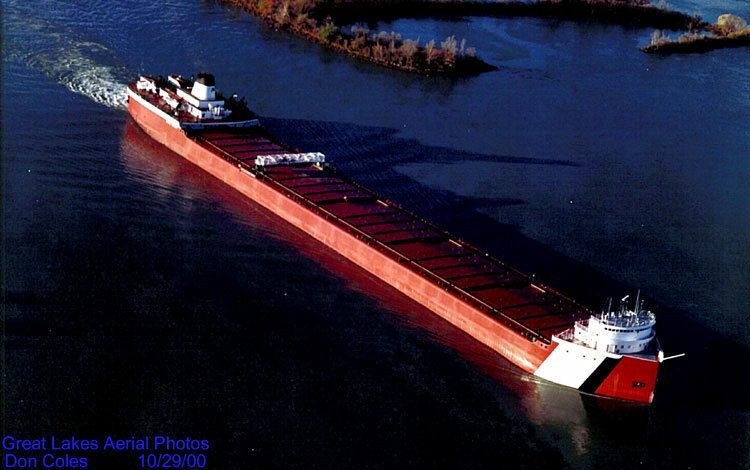 For the remainder of the 1987 season, the vessel ran 21 trips carrying 900,000 tons of taconite pellets into the Gary, IN plant. On April 23, 1994; the vessel was in collision with a foreign freighter in Chicago causing only minor damage to the port lifeboat davits. 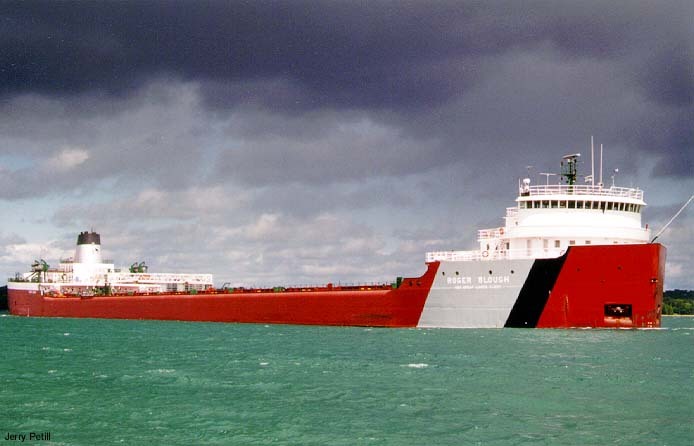 Then in August of 2000, the vessel is noted to have struck a pier at the Soo causing damage to several plates and a crack forward on the port side; repairs being completed during the winter lay up of 2000/01 at Sturgeon Bay, WI. 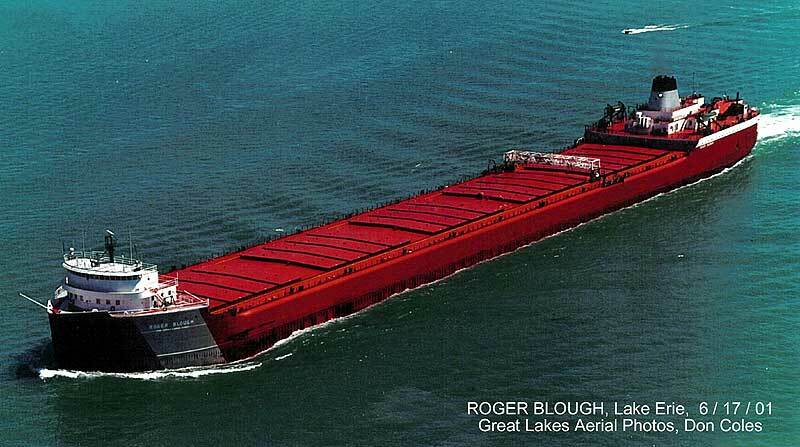 In recent years, the Roger Blough has seen sporadic mid season lay ups due again to her self unloading system design. The Roger Blough is the largest traditional styled lakeboat sailing the Great Lakes that was constructed from the keel up on the Great Lakes. 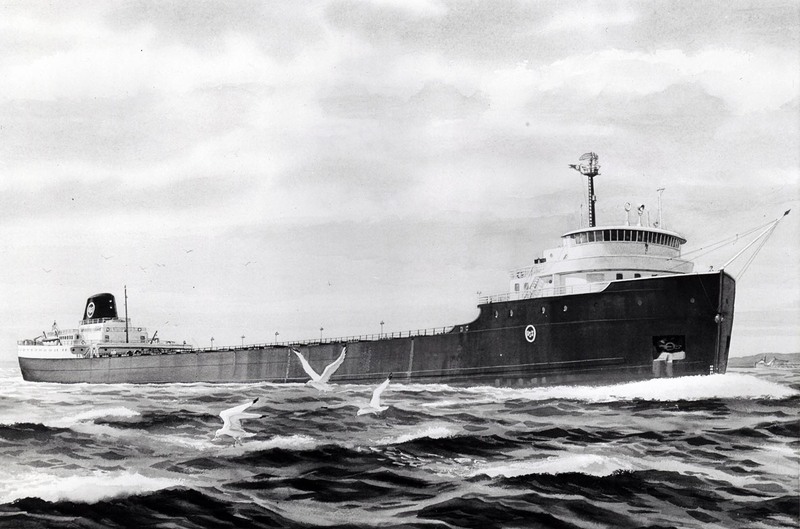 (The 1,000 foot Stewart J. Cort launched in 1972 was assembled on the Great Lakes but had sections built outside the ‘Lakes.) 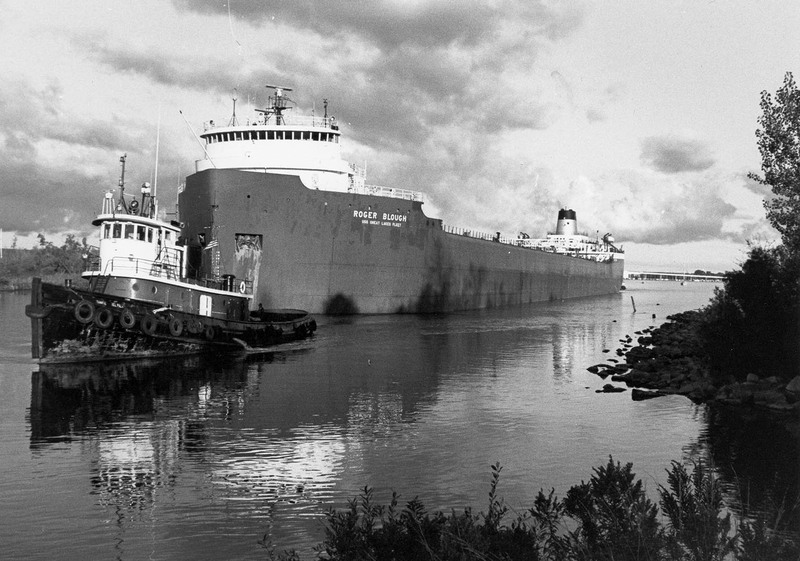 She also remained the largest lake-built vessel sailing until the launch of the 1,004 foot James R. Barker in 1976. (The 1,000 foot Presque Isle (2) launched in 1973 was constructed similar to the Stewart J. Cort previously mentioned.) The Canadian built Algosoo (2) launched in 1974 remains, though, the last of the traditional styled lakeboats built and sailing today. In August 2006 the Bough lost its rudder in the lower St. Marys River and anchored near Raber Bay off of Lime Island. Fleet mate Edgar B. Speer arrived on scene three days later and the Blough was lashed along side the Speer for tow to Gary Indiana, the Blough original destination. The tow departed on August 9 and arrived in Gary on August 11. 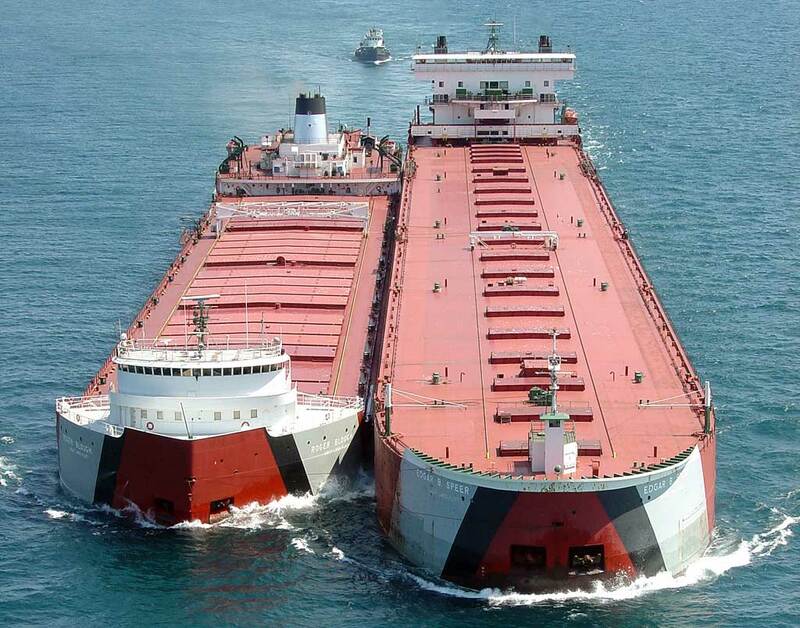 The Speer left the Blough at anchor while the Speer unloaded, both vessels use the same hopper to unload with their short unloading booms. The Blough was then towed to Sturgeon Bay for repairs. 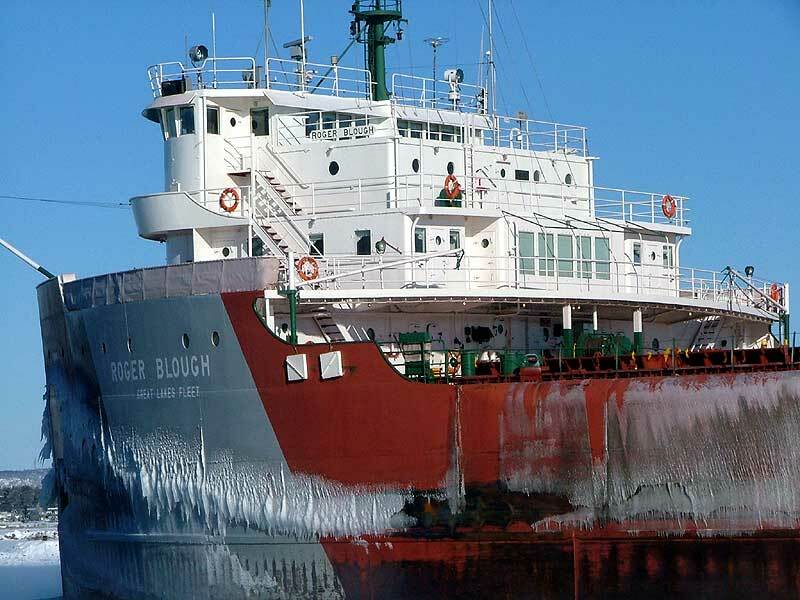 The Blough was the third boat to lose a rudder in the same area of the St. Marys River in recent years. The other two were the Edgar B. Speer and the Mississagi. 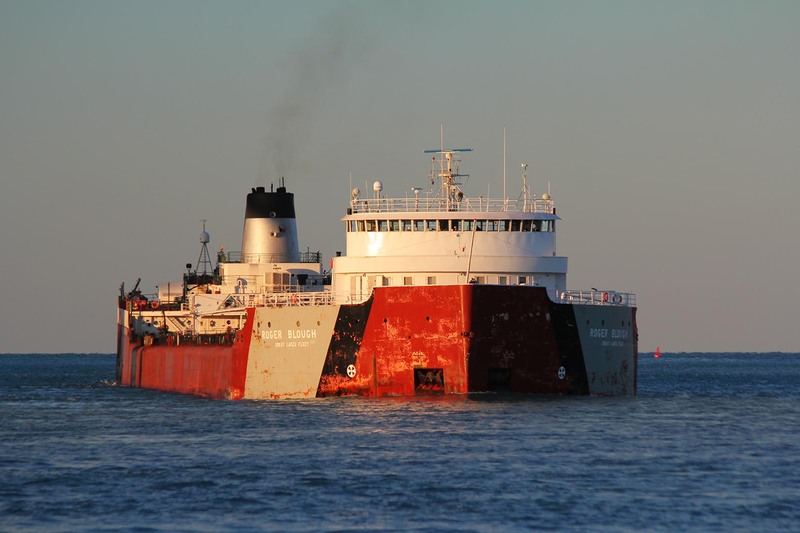 On May 27, 2016, Roger Blough ran aground near the Gros Cap Reef Light in the upper St. Marys River, puncturing steel in multiple places and flooding her forward ballast tanks to the waterline. No one was hurt or pollution reported, but the damage to the ship was significant – $4.5 million worth to the Blough’s hull and interior cargo system of tunnels, belts and pulleys. Freeing the Blough required a two-day lightering of her taconite iron ore cargo into a pair of fleetmates, the Arthur M. Anderson and Philip R. Clarke. Afterward, the Blough was shepherded to a shipyard in Sturgeon Bay, Wis., to be out of commission for about two months of repairs. The National Transportation Safety Board determined that the probable cause of the grounding was the second mate’s failure to use all navigational resources to determine the ship’s position as it approached shallow water near Gros Cap Reef. Contributing to the accident was inadequate monitoring of the vessel by Vessel Traffic Service (VTS) St. Marys River. 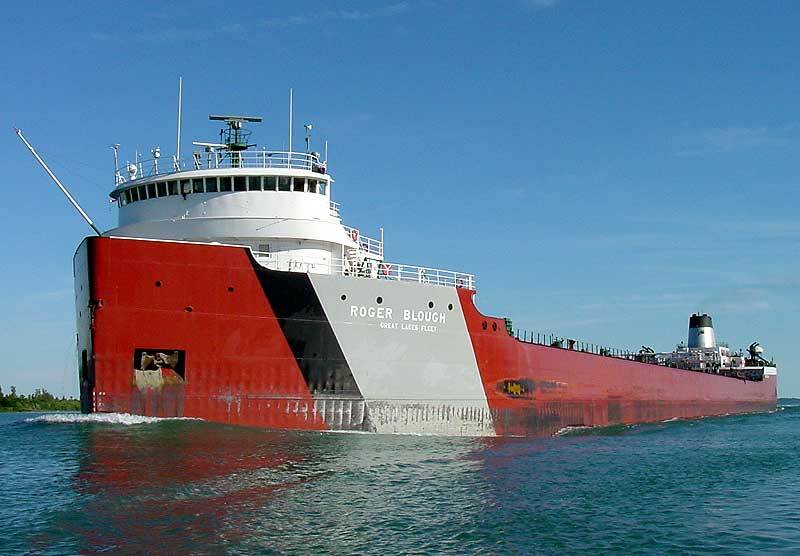 The Blough currently sails under the ownership of Great Lakes Fleet, Inc., Duluth, Minn. This ownership is, in effect, a derivative of the vessel’s original owners, which in recent years divested their marine operations. Since 1999, cargoes of limestone and stone have been carried with relative success in unloading, in addition to the regular cargoes of iron ore pellets. A concept drawing of the Blough. The bow section under construction. Stern view of the section. 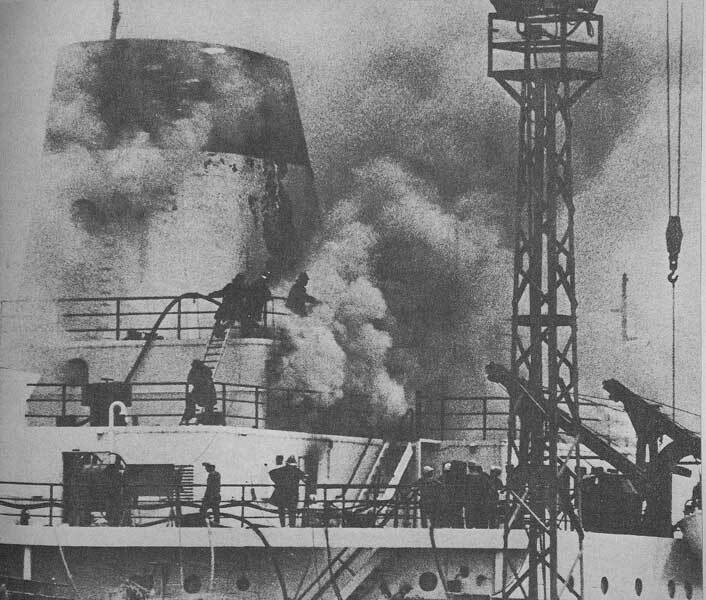 Newspaper photo shows the Blough on fire at the shipyard in Lorain, June 24, 1971. Rock Cut in the Fall, 1972, her first season of operation. Celebrates the Bicentennial in this photo taken at Mission Point in 1976. 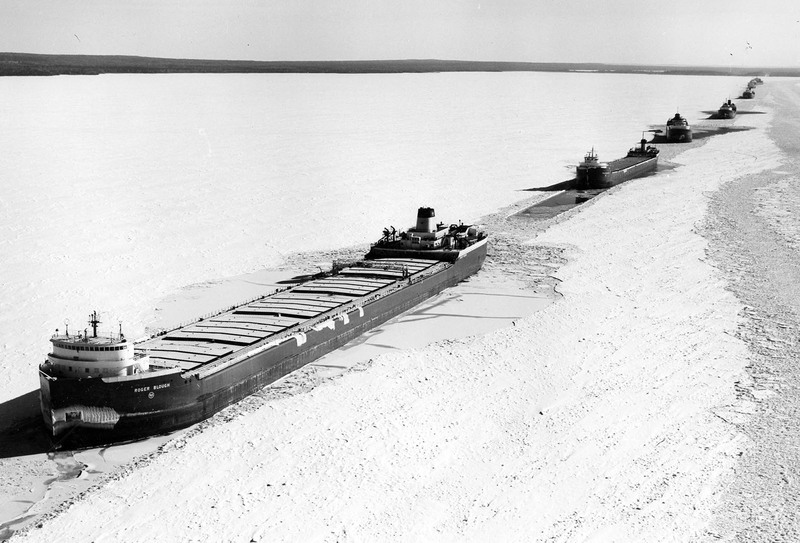 Leading an ice convoy in the lower St. Marys River, Jan. 19, 1978. Leaving Sturgeon Bay through the ship canal with assistance from the Minnie Selvick. Aerial view, Oct. 29, 2000. Close up of bow while laid up, March 9, 2001. View of boom extended out. Forward cabins, May 30, 2001. Aerial view in Lake Erie, June 17, 2001. Bow on view, June 10, 2001. On the Detroit River, June 16, 2001. Boom in its cradle, June 16, 2001. Loading in Duluth, April 6, 2002. Downbound the Detroit River, April 15, 2002. On the Detroit River, July 11, 2002. Unloading stone in Duluth, Oct. 5, 2002. 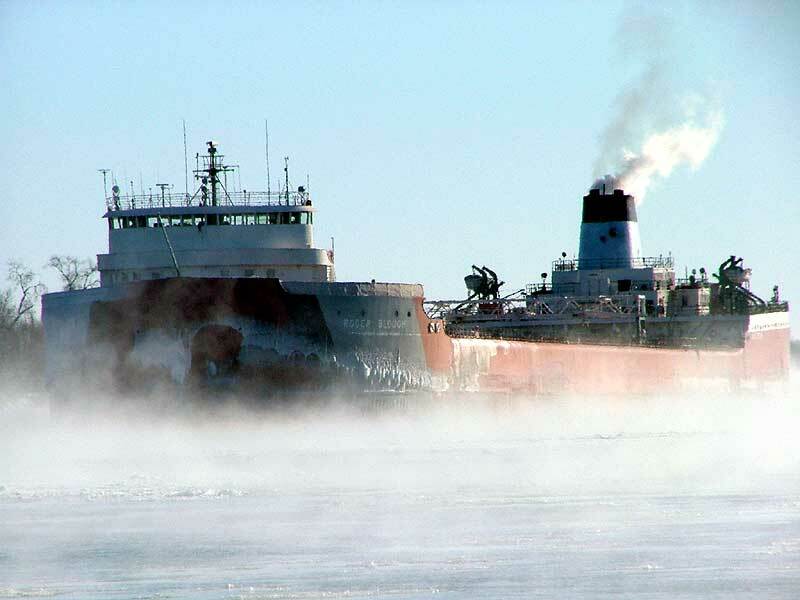 Roger Blough slips through a low hanging fog on Lake Superior off Copper Harbor, June 2003. Upbound below Mission Pt. with sea smoke, Jan. 9, 2004. Close up of the ice on the bow. Under tow of the Edgar B. Speer, Aug. 9, 2006. Stern view of the tow. St. Marys River, Sept. 1, 2006. At the Old Ore Dock slip in Erie for winter lay-up, Jan. 25, 2009. View from a nearby overlook dwarfing the smaller J. S. St. John at the head end of the slip. Under the tarps at Sturgeon Bay Shipyard getting a fresh coat of paint, Dec. 8, 2011. Making her way through thinning ice in Lake Michigan southwest of Lansing Shoal, just northwest of Beaver Island, April 2015. Aground at Gros Cap with the Edgar B. Speer slowly passing, May 30, 2016. Another view with the Edgar B. Speer and Algolake slowly passing. View from Pt. Iroquois with the Philip R. Clarke along side, June 2, 2016. Aerial view with Gros Cap Reef Light and the Philip R. Clarke, June 3, 2016. Unloading into the Philip R. Clarke. Aerial view of the unloading process. Tugboats Scott Purvis and Anglian Lady are rafted to the side, June 3, 2016. Philip R. Clarke rafted together. Note the slight listing of the Blough to her port side. Boom from the Blough seen between the two ships, along with a Yokohama fender to keep them apart during the unloading process. Downbound at Mission Pt. bound for Sturgeon Bay Shipyard for repairs, June 11, 2016. Heading into Lake Huron from Port Huron, June 8, 2016. Coming off Lake Huron downbound, Sept. 30, 2017. Past the Blue Water Bridge.